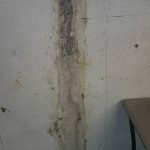 If you’ve found cracks in walls or foundation cracks, then you know that you need answers. After all, cracks are often indicative of a larger problem that likely also needs to be fixed. Cracks that form as the result of a foundation problem can also lead to additional problems, such as water in your basement. The longer you wait, the more you put yourself at risk. That’s why your first step should be an inspection to determine the cause of the cracks. A professional will be able to guide you on the steps you should take next. 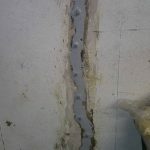 While the larger problem at hand will also need to be fixed (or else the crack will just keep reappearing), for the concrete crack repair, your best solution may be a poly injection—which is short for polyurethane injection. It’s important to note that this is a repair strictly for preventing water intrusion. If there is a structural crack that is leaking, we can also lay carbon fiber over the injection. But it is important to inject the polyurethane prior to carbon fiber in case you can’t go back and waterproof later. So, what makes polyurethane the best choice for waterproofing? The polyurethane that is used for crack repair is a rubbery material that comes in fluid resin form. When it is injected into a crack, it will undergo a chemical transformation from a liquid to a solid. As it fills in, it is also expanding and fully filling every crevice of the crack. Because it cures while expanding, it is far superior to outdated epoxy injection which won’t expand. It’s impossible to fully fill a crack with epoxy injections. At Adams, we will not drill into your wall to inject the polyurethane. Instead, we use a port that is placed on the surface of the crack. We can also perform beam pocket packing. When an I-beam is poured too close to the outside wall, it can crack and fall out around the beam. But we can use Xypex, a hydraulic cement that waterproofs by crystallization, to pack it back flat with the rest of the wall. At the end of the day, what you want is a company that can give you options when it comes to your concrete crack repair. You also want to feel confident you’ll choose a company that can offer you the best. Unfortunately, plenty of companies are still using outdated methods to fix foundation cracks and this will only set you up for failure. By working with the right company, you can have the peace of mind that your problems will be solved successfully.